It is once again drawing close to that time of the year when Thailand bursts into life and celebrates the new year. Songkran is one of the most celebrated festivals in Thailand – the whole country joins in to bring in the Thai New Year together. If you are visiting Thailand during this period in April, you are in for a treat! Alternatively, if you are an expat in Thailand, or working there on business, you will undoubtedly join in the celebrations too. If you want to be a part of the Thai New Year we have created an extensive guide. In the paragraphs below, we look at the origins of Songkran, what you can expect, and where you can find the festivities. Songkran is a festival that is steeped in tradition – it hails from an ancient tale found in Buddhist scriptures. The word Songkran means “movement” or “shift” – it relates to the positioning of the sun within the zodiac. Songkran specifically means when the sun moves between the Pisces and Aries zodiac signs and coincides with the start of the Thai New Year. It matched the solar calendar. This is why the specific dates of 13th to 16th of April are used as this is when the sun passes between these two Zodiac signs. Songkran has been celebrated for hundreds of years and has a host of traditions that the whole nation takes part in. Merit-making is a long practised tradition of the Buddhist faith. During Songkran, Thai citizens will visit their local temple in the morning to provide an offering of food to the monks. They will also purify each other with water and pour water on Buddha statues. Songkran is best known for its immense water fights. The original tradition has somewhat become lost, but the process of pouring water on others is to cleanse and purify – to wash away sin and bad luck. Many Thai citizens will do this at local temples together with the Buddhist Monks. They will also join in huge organized water fights that can be found in most large cities. Songkran is seen as a festival of unity. Due to this fact, traditionally people will return home to be with their families. Students studying abroad or in other regions will return to their parents’ homes. Whole families will come together to embrace the celebrations and respect will be given to family elders. 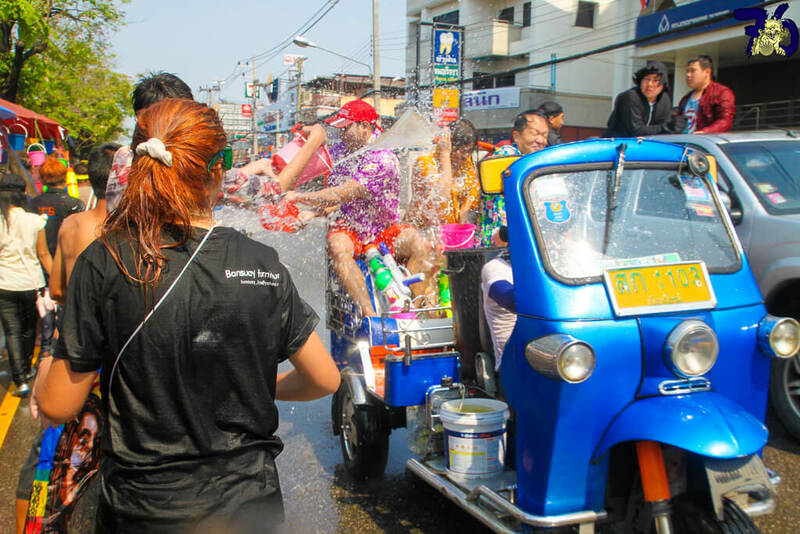 For the craziest Songkran experience, head to Bangkok or Chiang Mai – the water fights here are the stuff of legends. For a quieter affair, Koh Samui offers a more reserved Songkran that concentrates on traditions as opposed to water fights. 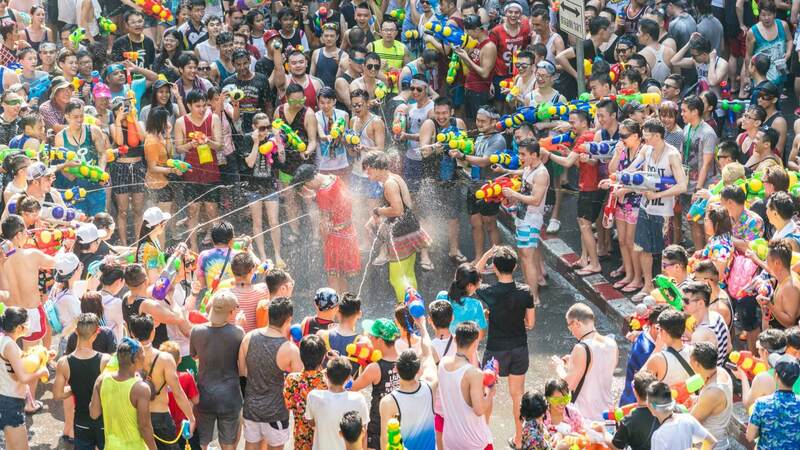 Water fights are a huge part of Songkran. Traditionally, water is meant to be poured on each other to cleanse the spirit. This has taken on a whole new meaning, however. Whole streets are closed in major cities such as Bangkok and immense water fights break out. – Be respectful if someone doesn’t want to get wet! There is no denying that some tourists go too far – they can ruin it for others. Don’t be one of those people. Always be respectful and remember the underlying traditions of this festival. If you participate in the water fights, just be ready for a no-holds-barred, adrenaline-fuelled party. If you don’t want to get wet, then we advise staying away from these popular areas as some people do not respect your wishes. Aside from the water fights, there are other activities to enjoy. During this period, there are parades through the streets, beauty pageants and other celebrations. Furthermore, Thai citizens dress up in traditional clothing – bright colours are fantastic to behold. In central Thailand, animals are offered as merits. Alternatively, in Northern Thailand, firecrackers and gunfire can often be seen and heard. Practically everywhere in the country, you can experience something different. Songkran really is an amazing festival to experience. There is nothing quite like this anywhere in the world. Thailand is already a fantastic location to visit. If you want to get a slice of true Thai culture and mingle with the locals – Songkran is a great time to do so.